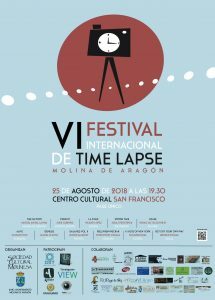 The “Sociedad Cultural Molinesa” (SOCUMO Cultural Asociation) and the Molina de Aragón City Council (Guadalajara, Spain) finalize the preparations of the 6th International Timelapse Festival, which will take place next Saturday, August 25, beginning at 7.30 pm, at San Francisco auditorium. This Thursday, some of the finalists and jurors from different countries such as Germany, Austria, Russia or Israel and different parts of Spain will be received. A large banner crosses the main avenue of Molina de Aragón (Guadalajara) announcing this 6th International Time Lapse Festival, while several City Council workers and technicians are finalizing the preparation in the great hall of San Francisco, on the occasion of this great event. Meanwhile, the “Sociedad Cultural Molinesa” (SOCUMO Cultural Asociation) gives the final touches to the program to receive their guests of honor. Specifically, Peter Jablonowaki (A taste of New York), from Austria; Jonathan Adler Trifon (Get out your own way) from Israel; and Oliver Hoffmann and Alexander Oettinger (Feel Rhein-Neckar) from Germany have confirmed their attendance. For the first time, the professional jury is made up of specialists in different areas of this technique. Between them, Carlos del Amor (RTVE, Madrid), Oscar Sarmiento (RTVE, Madrid), Polina Kutukina, Stop Motion animator (Russia), Fran Muradas, specialist in Time Lapse (Galicia) and Pilar Catalán, Ángel R. Herreros and Miguel Ángel Langa, photographers from Molina de Aragón will attend the event. For all of them, the organization has planned a wide program of activities and visits so that they can know and enjoy the important natural, cultural and gastronomic values of the region of Molina de Aragón-Alto Tajo, recognized by UNESCO as a Geopark and from which, around half, in the southern part of the territory, it was declared a Natural Park in 2000. This year, as a novelty, the Festival moves from the auditorium of Santa María del Conde, to San Francisco venue, with double the capacity (about 500 seats) and has increased the investment in sound and on a big screen of 32 square meters. In this way, Molina de Aragón wants to become the world capital of Time Lapse technique. It is a pioneering international initiative promoted by the “Sociedad Cultural Molinesa” (SOCUMO Cultural Association) with the intention of turning this city of Guadalajara province (Spain) into a place of reference worldwide. In fact, it is the only festival of its kind in Europe and there is only one similar initiative in North America, the “Time Lapse Film Festival”, created in 2016. Time Lapse is a photographic technique that basically consists of accelerating time: Photographs are taken with an interval between them and then they are reproduced at a higher speed to create an accelerated video, where you can see in seconds what has happened in minutes, hours or days. In addition, high quality images are achieved. As in previous editions, this year have also accepted work done with the Stop Motion technique, which differs from the Time Lapse in that, between photo and photo, the position of the elements that appear in the scene is modified to provide them with movement. For this edition, a total of 461 works have been received from 72 different countries around the world. The members of the professional jury are: Polina Kutukina, director and animator of Stop Motion; Daniel López, time-lapser; Gunter Wegner, time-lapser; Pablo Pez, director of Photography; Carlos del Amor, television journalist; Pilar Catalán, photographer; Ángel R. Herreros, photographer; Uge Fuertes, Nature photographer; Roger Subirana, composer of Music; Óscar Sarmiento, Television producer; Fran Muradas, time-lapser; and Miguel Ángel Langa, time-lapser. Access to the room will be made in order of arrival, with a ticket in hand. The “Sociedad Cultural Molinesa” (SOCUMO) is a non-profit cultural association, which through activities such as this, tries to promote creativity and culture and, at the same time, make known Molina de Aragón city. This event origin was a screening of works by one of the partners, accompanied by friends with the same passion for the Time Lapse. It was completely successful and SOCUMO decided to turn it into a contest. Even then, jobs were received from all over the world. “Every year, this association tries to improve the festival with the accumulated experience. The participants of past editions are our best ambassadors since they can tell how they have lived this event and the days they have enjoyed our territory. We want to turn this initiative into a national and international reference festival on Time Lapse and Stop Motion and to make known our city, Molina de Aragón, and the surrounding region” adds Miguel Ángel Langa, partner of SOCUMO and the Festival director.